Lynne Avallone (lynneavallone.com) did my hair and makeup last summer and I just have to tell everyone how incredible she is. 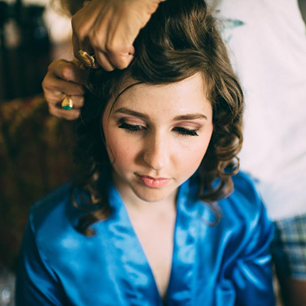 I was blown away by her skill - she put in my floral crown, curled my hair, put in gorgeous false eyelashes that looked so natural and really made the difference when my wedding pictures came out. I would highly recommend her. She's an angel on top of that and put everyone in my bridal party at ease. Will use her again and again forever! She travels all over CT, too! Thank you for the information. Getting married next year and was wondering about this.